Oncolytic Viruses: Novel Cancer Therapeutics Current cancer therapies for metastatic disease have limited efficacy and high toxicity and thus novel approaches to treatment are sought. Viruses have many characteristics which make them desirable as a therapeutic strategy for the treatment of cancer including their ability to infect cells and replicate, induce cell death, release viral particles and spread through human tissues. We have shown that a variety of viruses patients undergoing OV therapy that our viruses can infect and disrupt tumour vasculature. The affect of OV therapy on all aspects of tumour microenvironment (e.g. support cells, immune infiltrates) is under investigation. Dr. John Bell received his PhD from McMaster University in 1982. The three years that followed, he trained as a post-doctoral fellow at the University of Ottawa and then at the Medical Research Council in London, England. Dr. Bell began his independent research career at McGill University in 1986 and moved to the University of Ottawa, Department of Medicine, in 1989. He is a member of the Center for Cancer Therapeutics at The Ottawa Hospital Cancer Center, a Senior Scientist with the Ottawa Hospital Research Institute and Professor of Medicine at the University of Ottawa. 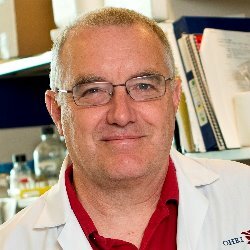 He heads the Canadian Oncolytic Virus Consortium, a Terry Fox funded group from across Canada that is developing virus based cancer therapeutics and is the Director of the Biotherapeutics Program for the Ontario Institute for Cancer Research. He is the Scientific Director of the National Centre of Excellence for the development of Biotherapeutics for Cancer Therapy and is a fellow of the Royal Society of Canada. Kwame Twumasi-Boateng, Jessica L. Pettigrew, Y. Y. Eunice Kwok, John C. Bell & Brad H. Nelson. Oncolytic viruses as engineering platforms for combination immunotherapy. Nature Reviews Cancer. Published online: 25 April 2018. doi:10.1038/s41568-018-0009-4. Free full text. Bourgeois-Daigneault MC, Roy DG, Aitken AS, El Sayes N, Martin NT, Varette O, Falls T, St-Germain LE, Pelin A, Lichty BD, Stojdl DF, Ungerechts G, Diallo JS and Bell JC. Neoadjuvant oncolytic virotherapy before surgery sensitizes triple-negative breast cancer to immune checkpoint therapy. Sci Transl Med. 2018 Jan 3;10(422). Free full text. Rozanne Arulanandam, Cory Batenchuk, Fernando A. Angarita, Kathryn Ottolino-Perry, Sophie Cousineau, Amelia Mottashed, Emma Burgess, Theresa J. Falls, Naomi De Silva, Jovian Tsang, Grant A. Howe, Marie-Claude Bourgeois-Daigneault, David P. Conrad, Manijeh Daneshmand, Caroline J. Breitbach, David H. Kirn, Leda Raptis, Subash Sad, Harold Atkins, Michael S. Huh, Jean-Simon Diallo, Brian Lichty, Carolina S. Ilkow, Fabrice Le Boeuf, Christina L. Addison, J. Andrea Mc Cart and John C. Bell. VEGF-mediated induction of PRD1-BF1/Blimp1 expression sensitizes tumour vasculature to oncolytic virus infection. Cancer Cell. 2015 Aug 10;28(2):210-24. Carolina S. Ilkow, Monique Marguerie, Cory Batenchuk, Justin Mayer, Daniela Ben Neriah, Sophie Cousineau, Theresa Falls, Victoria Jennings, Meaghan Boileau, David Bellamy1, Donald Bastin1, Christiano Tanese de Souza1, Almohanad Alkayyal1, Jiging Zhang, Fabrice LeBoeuf1, Rozanne Arulanandam, Lawton Stubbert, Padma Sampath, Steve Thorne4, Piriya Paramanthan5, Avijit Chatterjee5, Robert M. Strieter, Marie Burdick, Christina Addison David F. Stojdl, Harold L. Atkins, Rebecca Auer, , Jean-Simon Diallo, Brian Lichty, and John C. Bell. Reciprocal cellular cross-talk within the tumor microenvironment promotes oncolytic virus activity. Nat Med. 2015 May;21(5):530-6. Brian D. Lichty, Caroline J. Breitbach, David F. Stojdl, & John C. Bell. Going viral with cancer immunotherapy. Nature Reviews Cancer. 2014 03 July. Fabrice Le Bœuf*, Cory Batenchuk*, Markus Vähä-Koskela, Sophie Breton, Dominic Roy, Chantal Lemay, Julie Cox, Hesham Abdelbary, Theresa Falls, Girija Waghray, Harold Atkins, David Stojdl, Jean-Simon Diallo, Mads Kaern, John Bell. Model-based Rational Design of an Oncolytic Virus with Improved Therapeutics Potential. Nature Communications 2013 Jun 14;4:1974. Heo, J.,Reid, T., Ruo, L., Breitbach, C.,Rose, S., Bloomston, M., Cho, M., Lim, H.Y., Chung, H.C., Kim, C.W., Burke, J.,Lencioni, R., Hickman, T., Moon, A., Lee, Y.S., Kim, M.K., Daneshmand, M., Dubois, K., Longpre, L., Ngo, M., Rooney, C., Bell, J.C.,Rhee,B-G., Patt, R., Hwang, T-H., Kirn, D.H., (2013) Randomized dose-finding clinical trial of oncolytic immunotherapeutic vaccinia JX 594 in liver cancer. Nat Med. 2013 Mar;19(3):329-36.